Colne House is a beautifully converted Georgian property set in three acres of grounds on the outskirts of the tranquil village of Earls Colne, situated between Colchester and Halstead. Colne House delivers residential care for those living with dementia and/ or mental health problems; the home is registered to care for people under 65 as well of those of that age and above. With our unique person-centred approach to care and our ‘WINGS’ standards, you can be assured that your loved ones are perfectly looked after. Explore the services provided at Colne House, which are designed to make every resident’s stay a pleasant one. Set amongst the fields, streams and meadows of a delightful part of rural Essex, this beautiful old farmhouse consists of two buildings. A home that is full of life,laughter and love, with lots going on, that also provides residents with places to enjoy peace and quiet. Just as there is no typical Kingsley home, there is no typical day in a Kingsley home. We actively encourage all our residents to take part in daily activities to keep life fun and interesting; but there are opportunities to do as much or as little as people wish. Our care is focused around each person’s individual needs and we value and respect how each person chooses to spend their day. Residents can start their day whenever they like and have a choice between hot and cold breakfasts served in bed or in the communal, friendly dining room. Staff also eat with the residents and don’t wear uniforms or badges, which adds to the relaxed, homely feel of meal times. Breakfast is followed by an optional programme of activities, individually tailored to each resident, based on their likes and dislikes. These may include regular visits from the hairdresser, chiropodist, therapists, entertainment, local church and Pat Dog; activities such as movement and music, exercise and dance, tending to the vegetable patch, flower arranging, skittles, card making, jigsaw puzzles and board games; spending time with the pet cat or budgie and many others. There are organised and impromptu trips throughout the year including evenings out, sing-alongs, summer BBQs, themed events, as well as all the usual annual celebrations such as birthdays, Christmas and Easter. The garden and vegetable patch, where we grow our own fruit and veg, is one of the most popular pastimes at the house. Alternatively residents can spend time with family, relax in one of the spacious communal areas or in their room, watch TV, read a newspaper in the garden, play games, have one-to-one time with staff or chat with other residents – the choice is always theirs. Families and friends are welcomed at all times of day and residents are encouraged to maintain social contacts prior to life at Colne House. The passionate, caring staff are always on hand to be with residents if needed, at any time throughout the day and are compassionate about helping individuals to do what they enjoy. For lunch there is a choice of mains and desserts, and we invite the residents to help set the tables. All food is cooked on the premises and is made both with health and taste in mind. Menus are available on request. Meal times are a sociable time and staff try to engage even the quietest residents in activities and conversations. Many residents enjoy helping out around the home with dusting and other chores and have the opportunity to be involved with decisions made within the home, such as potential staff and new pets. We are hoping to get more pets in the future. Staff are encouraged to be impulsive, to swap stories, to laugh and cry with the residents, whilst residents are encouraged to follow their own interests and make their own decisions. They may want to listen to their favourite music, have some ‘me time’ or share their experiences with others. We want them to relax and feel at home, without conforming to routines. At suppertime there is a choice of hot or cold food, with at least two choices of main and dessert. After the evening meal, residents can opt to go to bed early, or stay up until later relaxing in one of the communal areas or in their rooms. There are hot and cold drinks, alcohol available to those that want it, and no set bedtime, as this is their home. Kingsley Healthcare’s person-centred approach to care creates a positive outlook and focuses on quality of life and relationships. We place much importance on the lives that our residents have led, and spend time with them and family members to find out about their tastes, history, hobbies and interests. The information gained helps us to create individual care plans, which are paramount in providing the best care and also, of course, helps us to get to know your loved ones well. Residents are supported to achieve their aspirations and dreams by taking part in meetings, surveys and one-to-one discussions. The unique person-centred approach is much appreciated by the residents who live with us, all of whom require residential or specialist dementia care. Its success is due to our staff’s continuing commitment to specialist training, which allows the individual to express their needs and supports them in maintaining a high level of independence, self-worth and well-being. The experience of individuals living here is that of love, achievement, encouragement and fulfilment. The staff all have a kind and caring nature, they understand the meaning of real person-centre care and are skilled in engaging residents in meaningful activities. Each Kingsley care home is unique, but we all have a set of highly respected and award-winning features embedded within the culture and the way we care for our residents makes a significant difference in their lives. Our daily emphasis is on the care that our residents need, whether that is physical, emotional, spiritual or mental. We are committed to providing the best possible outcomes for people living with a dementia, and we achieve this through our ‘Wings’ (Welcome, Individuality, Nurturing, Guidance, Sensitivity) philosophy of care. This award-winning approach is nationally recognized and our bespoke learning programme is designed to ensure that the person with a dementia is at the heart of everything we do. Both parts of the home are designed to be dementia friendly, and the annexe especially caters for those with a dementia. We encourage all our residents to live as healthily as possible, to aid long and pleasant lives. Where possible we encourage exercise, keeping minds active and eating nutritious food. Our healthy, balanced meals are made from scratch in our kitchen using only the best, locally sourced ingredients. We understand that people’s tastes and habits are different, and the varied menu and choices include a great selection of nutritious delights and tasty favourites, sure to bring a smile to everyone’s face. Residents often make suggestions for the menu and we like to ensure that individuals’ favourites are featured regularly. On the outskirts of the beautiful village of Earls Colne near Colchester, Colne House is a Georgian building set within spacious, beautiful landscaped gardens with breath-taking views over the Colne Valley. The home is close to the River Colne, has easy road links to Braintree, Colchester and Sudbury and serves Colchester, Fordham, Braintree, Halstead, Witham and the smaller surrounding villages. With its three large lounges and a dining room, music room, quiet spaces and safe, secure gardens; the home is a haven of peace, tranquillity and happiness. The home has a combination of single en-suite rooms and companion rooms for those wishing to share. It has two conservatories, one overlooking the golf course and one overlooking the beautiful grounds, and the entire home has a wonderful feeling of grandeur. Separate to the main building stands the annexe with five large en-suite bedrooms, its own independent lounge, open plan kitchen and conservatory. The annexe caters for specialist dementia care needs and younger people with a dementia. The annexe allows residents to benefit from the highest levels of care while maintaining independence. This is the residents’ home and we want them to feel happy in it; as such all residents are encouraged to furnish and decorate their rooms in the way they want to, and they also have much input into how the rest of the house is decorated or any changes that may occur. At Kingsley we place paramount importance on the needs and happiness of our residents. Visit us virtually – Take a 360o virtual tour and get a feeling of Colne House. You should know the people who are going to be taking care of you or your loved one, so take a look at our staff profiles below. We actively encourage those who are considering living at Colne House to visit and spend some time at the home to gain an accurate perception of the care we offer. You are invited to come for lunch or just for a look around. Staff are around at all times of the day and they will be happy to give you a guided tour and answer your questions. 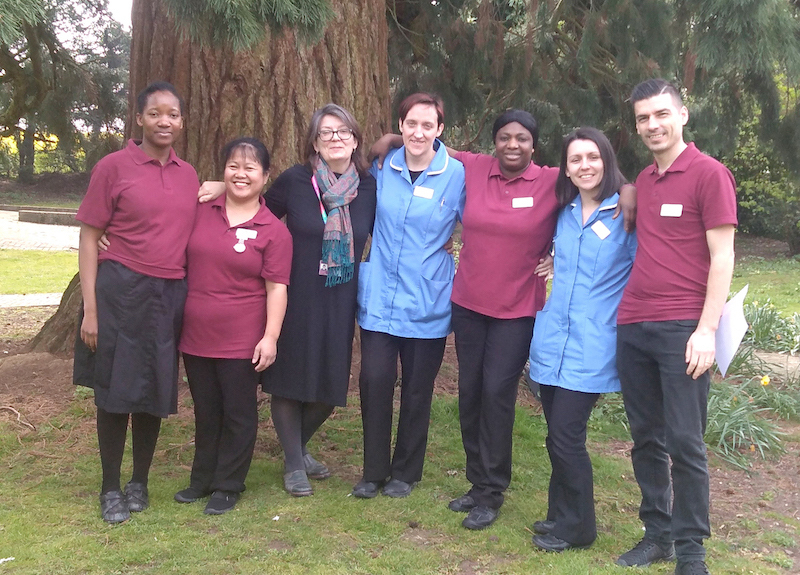 Meet our team members who are going to be taking care of you or your loved ones at Colne House. Please don’t forget that our ‘open house’ policy means visitors are welcome at all times. The team is selected through a very thorough recruitment process, which gives us reassurance that our staff are the very best. They undertake rigorous induction training, where they are supported and directed to overcome any difficulties they may come across. The team looks after our residents with emphasis on quality of life, and we strive to give purpose to every single day. I have worked in the caring profession for 25 years and gain pleasure from knowing that every day I make a difference to the residents’ that live at Colne. During which I have completed my level 3 in Health and Social Care and worked as a care coordinator in a day unit. I have been with Kingsley for over a year now and currently training towards a level 5 in Health and Social Care. The Kingsley Way is like a breath of fresh air where every day is different and led by the needs of the residents not by structured routines. We celebrate all the usual annual festivities, national holidays, birthdays, anniversaries and unique special occasions, and encourage all residents and their families to participate if they want to. A bi-monthly newsletter is published and made available to visitors, however it can also be downloaded from the website. Inside you can read all about the events that have either already taken place or are planned for the future, in which you might like to get involved. It also contains announcements from Kingsley Healthcare, future improvements to the home, recent charity events we have been involved in, photos and much more. You can subscribe using the form below and have the newsletter emailed to you, which makes it easier to catch up with the latest news and reduces our carbon footprint. Dylan the PAT Dog Wednesday 21st March..
St Patricks Day Sunday 17th March..
Red Nose Day Friday 15th March..
Music and movement Friday 8th March..
Notley club and world book day Thursday 7th March..
Pancake Day - Handbag sale and coffee morning Tuesday 5th March..
Kiddley Divey Friday 1st March 3.30pm..
Music & movement - 2pm..
Visit to the Notley Club..
Frederick Douglas Performing Arts Academy will be performing Cinderella.21st December 2.30pm..
MACMILLAN COFFEE MORNING INCLUDING HANDBAG SALE 11am..
Julie Wisbeach singing followed by “mad hatters tea party”..
Summer garden fete at Colne House care home, in Station Road, Earls Colne. Saturday, July 14, noon to 4pm. Traditional fete games for t..
w/c 23rd GARDEN JUDGES TO VISIT..
WEDNESDAY 18TH KALA AND HER OWLS 2PM..
FRI 6TH 3.30 PM KIDDLEY-DIVEY..
Friday 13th April 2 pm - music and movement..
We are having a red/yellow day next Friday In aid of Essex air ambulance week. We will have a coffee morning and staff will dress in red or ..
Care home staff will hold a charity garden fete in memory of a much-loved colleague who died aged 53. Mr Matthew, a dad of two, was he.. Clothing Event at Colne House.Starting from 2:30pm..
Kiddleydivey music for health 3.30 pm..
Nancy music for health. Event start at 10:00 am..
kiddleydivey music for health. Starting at 3.30 pm..
Come and enjoy Music with Janine Leigh. Event start at 2 pm to 3 pm.. Cream Tea, Tombola, Raffle, Various stalls, Garden games, MusicVenue: Colne House, Colchester, EssexTime: 2pm – 4..
Roger the Cowboy to entertain on the guitar and organ. Followed by buffet and raffle.Starting at 14:30pm to 16:30pm..